"I am declaring this as one of the brightest days of my journey in politics and public life in Dominica," said Prime Minister Roosevelt Skerrit at the ground breaking ceremony of a new national hospital as an orange sun set on 8 August 2016, under wide, white tents at the Lindo Park just outside of the Princess Margaret Hospital (PMH). Indeed, Skerrit has reason to celebrate. That new facility, to be constructed on the PMH grounds while the business of health-care continues there, will be the delivery of one of the four-pillar projects that the People's Republic of China promised when Dominica and China established diplomatic relations in March 2004, that is, twelve years ago. The other three legs in the 4-pillar One China-Dominica diplomatic gift are the Windsor Park Sports Stadium, the Edward Oliver LeBlanc west coast road and the Dominica Grammar School building. 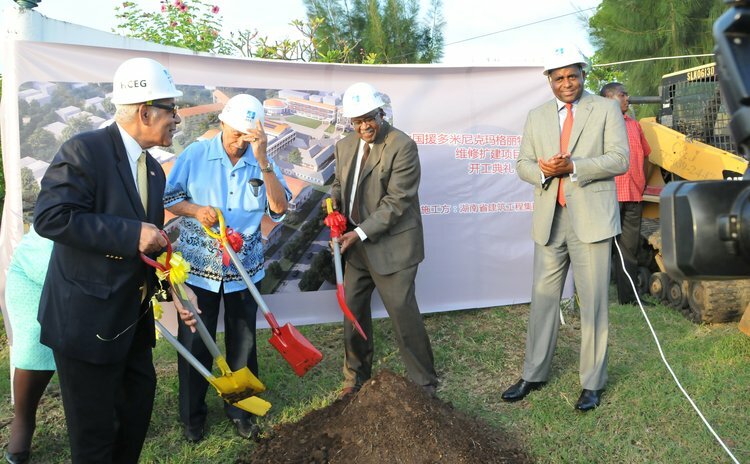 The refurbished PMH, now unofficially referred to as the new national hospital, is to be constructed by the Hunan Construction Engineering Group Corporation in seven phases over 30 months at a cost of US $40 million (EC$81.3 million). At the ceremony, Sylvester Henderson, the Projects Officer in the Ministry of Health and Environment said the new hospital will replace the more than 60-year-old PMH, a facility that was constructed between 1953 and 1955 but underwent major additions and repairs over the years. It was named after Princess Margaret, the sister of Britain's Queen Elizabeth II. Formerly opened in 1956, the PMH replaced the Roseau hospital that was situated on Hillsborough Street, on the site of the Government Headquarters. The PMH, a 225-bed medical facility, lies on 10.5 acres in the middle of Federation Drive area in Goodwill and has served as Dominica's major health care facility. "This is a very timely project and the options are also limited without this new building we may not be able to address the major health issues that continue to challenge our country," added Henderson. Helen Royer, the Permanent Secretary in the Ministry of Health said the new national hospital project required leadership, foresight, careful planning and philanthropy. Royer noted that the Ministry of Health is on a mission to ensure that upon completion there will not only be a transformation in services but the quality of care provided. "It is our hope that the investment the Government of Dominica has made in our human resource through training will equip our staff and advance the project and ultimately culminate to better patient outcome," she said. Li Jiangning, the Chinese Ambassador to Dominica said the new gift from his government will help Dominica deal with current and new health issues to the long-term social and economic development of Dominica. "It will be the most complicated and challenging project for both sides," said Ambassador Jiangning. Meanwhile, Prime Minister Roosevelt Skerrit said that quality health care is among the defining features which characterise the development of a nation. "No matter the price of land, the cost of construction, the climate, the cost of living, the crime and safety record, the quality of education, both private and public, one of the essential features that residents and investors look for the accessibility and availability of quality affordable health care," said Skerrit. In that regard, the Prime Minister applauded the staff of the PMH for their ability to provide quality health care under strenuous circumstances. "I admire how you have done so much with so little especially in recent years while it was clear that we would not have been refurbishing the existing hospital building and replacing several pieces of vital equipment due to the commencement of the construction," he said.